Ramón Aguirre lived in the village of Adjuntas de Peñasco in the Mexican State of Zacatecas until he was 15 years old when his family immigrated to the United States and Phoenix after waiting 10 years for green cards. In this village of just a few hundred inhabitants, his only exposure to art was by turning the pages of the tattered Bible that his grandmother gave him and his brother and sister to read. Throughout the Bible, there were beautiful illustrations of Old and New Testament stories. With his father away for more than 15 years working in the United States in order to send money to care for his family, Ramón, as the eldest child, became the man of the household taking on responsibilities of being a role model, caretaker, and starting work at age 10 harvesting crops to help feed his family. Ramón found freedom when he moved to Phoenix. After finishing high school, he attended Phoenix College where he took on a new persona as Raymond because as Ramón people would not talk with him or befriend him. At Phoenix College he discovered art and artists and people he identified with in talking about and making work, and a new ability to be expressive through the discovery of his nascent visual voice. The lion in the den was awakened and began to roar! 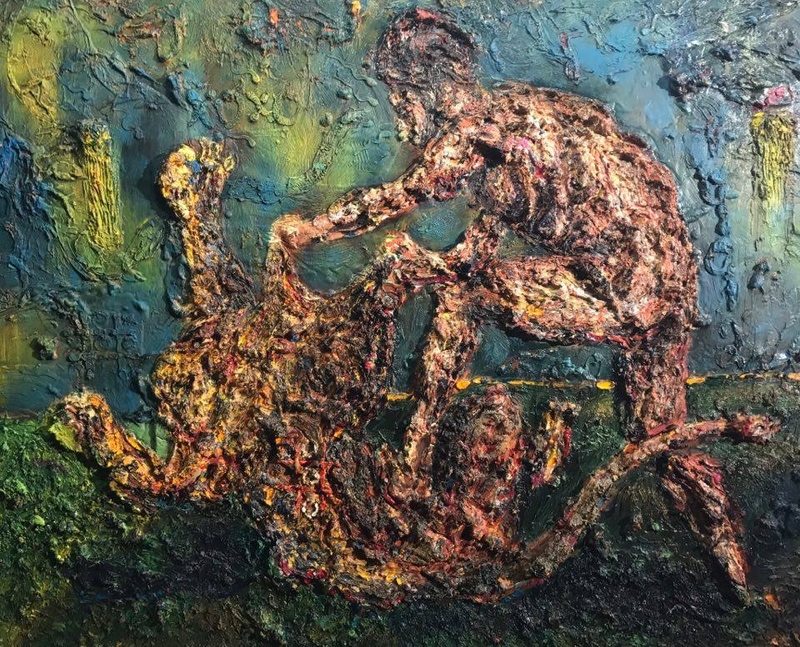 The 5 figurative paintings Ramón produced for his exhibition with phICA make reference to 5 Biblical stories in which he uses himself and family members as protagonists and antagonists. 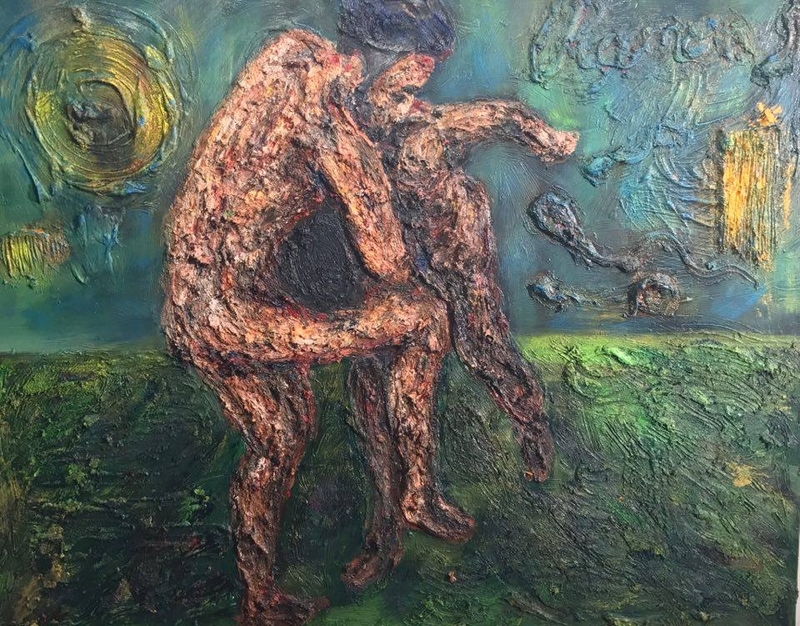 Ramon’s large mixed media works are striking for their thick buildup of acrylic paint applied over modeling paste in a textural focus on bodies, muscles. They have an almost invasive 3-D effect projecting out from the wall, expressing his point while disarming and engaging viewers, reminiscent of the work of Jay DeFeo who is closely associated with San Francisco Bay Area artists, the Beat Generation, and Abstract Expressionism in her challenge to the hierarchal use of materials. The auto-biographical paintings employ biblical protagonists and antagonists as metaphoric stand-ins for expressing his own ongoing internal battle with angels and demons, his fears and concerns, sexual pleasures vs. doctrinal moral stances, difficult emotional and visual memories, and moving himself forward to conquering these and shouting out loud. For example, in Everardo de David and Ramón de Goliath (2016), we see a reference to the epic biblical event of the boy and future King David slaying the giant enemy Goliath in order to save his people. His brother Everardo is David, Ramón is Goliath. But in a twist on the original tale, Everardo, for whom Ramón personally sacrificed when helping raise him, doesn’t slay Ramón but rather helps Ramón conquer his internal enemies. Ramón survives and is victorious; some of his evil demons are not so fortunate and fall away. 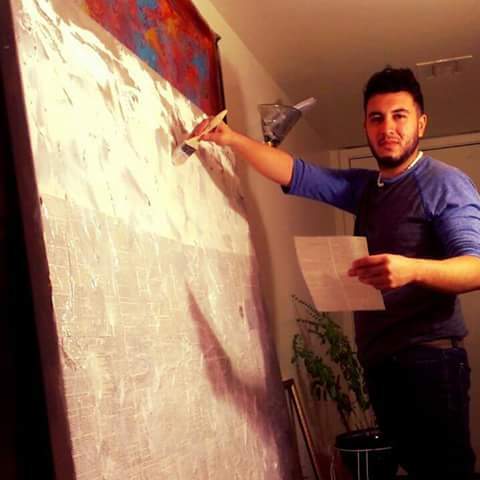 Ramón uses his freedom to express himself as opposed to holding back his emotions and thoughts as he was religiously programmed to do. He is a remarkable man and an artist of promise, one to keep an eye on. As a heartwarming and amazing postscript, Ramón’s younger brother Everardo is graduating with a degree in Business Administration from Grand Canyon University this month and his younger sister Victoria is attending highly-esteemed Xavier College Preparatory, testaments to a good family and a remarkable older brother who is extremely proud.